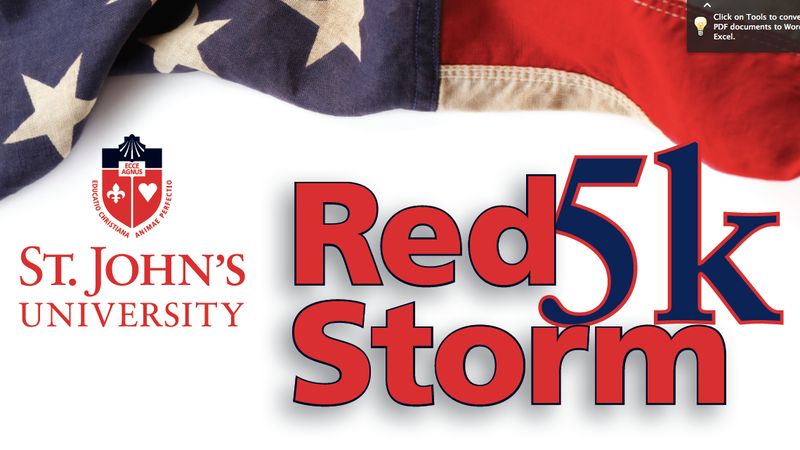 St. John’s Athletics, in partnership with the St. John’s Army ROTC, invite you to the Red Storm 5K Run/Walk. This race will take place entirely on St. John’s University’s Queens campus and will support both student-athlete scholarships and the Army ROTC program. A portion of the proceeds will be donated to the Lead The Way Fund, Inc. which is a non-profit organization established to raise funds in support of disabled U.S. Army Rangers and the families. The race will start at 10AM. Kids 12 and under are also invited to join in on the fun at the Junior Johnnies Fun Run. The Junior Johnnies Fun Runs will be broken up by age brackets and the distances will increase from 100 yards to a ½ mile. Each runner will receive a prize at the end of their race. All the Fun Runs will take place in the DaSilva Memorial Field Track/Lacrosse on campus. Parking is available on St. John’s campus next to the start line and the Q46 bus will drop you right in front of the university if public transportation is your means of travel. Registration & Packet Pickup: 5K Bib and shirt pick-up will occur both on Friday, October 3 from 12:00PM – 7:00PM and on race day from 8:30AM until 9:45AM in the lobby of Carnesecca Arena. Fun Run registration will continue until 11:00AM. Amenities: The first 400 5K runners and first 100 Fun Run participants will receive a commemorative Under Armour shirt on race day and there will be special prizes for the top 3 male and female finishers as well as age group champions. Stick around after for the post-race festivities at the DaSilva Memorial Field Track/Lacrosse Complex for bananas, bagels, and coffee as well as other FREE GIVEAWAYS from SJU Athletics, Muscle Milk, Under Armour & more. Fees: 5K Registration is $25 for SJU Students (current Storm Card must be shown at registration) and $30 for all others through 10/3. Registration will increase to $40 on race-day. The Fun Run is $10 per runner.